When considering your first ski trip, be sure to make plans for some quality beginner ski instructions. While friends and family members may offer to show you the basics, most people do much better by taking a lesson with a professional. Try these tips to get started on the slopes. Heading out to the slopes for the first time can be quite intimidating. Knowing what to expect can ease your stress and get you prepared for an action-packed day filled with fun and adventure. You may want to rent equipment when first starting out. This will give you an idea of what works best for you and what size ski you prefer using. A rental shop will be able to fit you to the best equipment for your ability and give you instructions on how to put on your boots and skis. You are now ready to get out in the snow and start skiing! Posture is an important part of skiing. A good stance will keep you balanced and allow you to ski more efficiently. 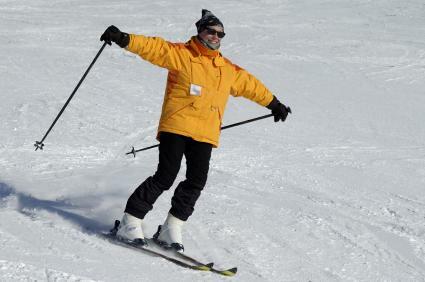 You can practice your stance easily before hitting the slopes, so the posture will start to feel more natural. You will want to lean forward with a slight bend to your knees. Do not lean back or this may cause you to fall and quickly lose your balance. A proper position for skiing is one that has you centered over your feet with your weight putting pressure on the fronts of your boots. Keep your feet hips-width apart and your head looking forward. The snowplow is one of the most basic moves for skiing. To accomplish this, the skier puts her skis in a wedge position where the tips are closer together than the backs. The snowplow is used to slow a skier down and to stop. When snowplowing, keep your weight distributed equally on both skis and have your skis flat in the snow. Try to keep your tips from crossing. This move is the one that is first taught in ski instruction. Everyone will fall from time to time while skiing. Getting up from a fall can often be one of the biggest challenges, especially for beginners. If your ski came off during the fall, get up and lay your ski flat in the snow. You can step back into the binding and get your ski back on. If you are on an incline, lay your skis parallel to the mountain so you can gain stability and make this process easier. 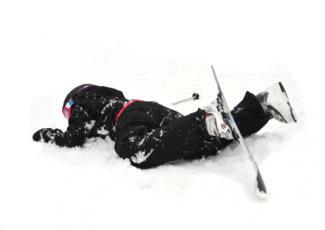 If your skis are still on when you fall, you will need to position yourself so that you are laying across the hill. Firmly grab the poles and plant them into the snow. Place one hand on top of the pole grips and the other hand about halfway up the pole. You will then pull yourself up with your top hand and begin to stand while putting pressure on the hillside edge of your skis. This will take practice to master. Every resort will have at least one type of lift. Get familiar with the resort before you go skiing so you will know what to expect. The best type of lift for a beginner is the Magic Carpet. This lift is a conveyor lift where the the skier stands on a moving belt and is transported up the mountain. All you need to do is step on and stand until you reach the top. Another lift suitable for beginners is the Rope Tow. A skier holds on to a handle and is pulled up the hill. Place your poles in one hand and with the other grab the rope. You will want to lean back slightly and gradually tighten your grip on the rope. Your skis should be pointed forward at all times. Chair Lift: This lift can be difficult to master. Chairs move quickly and require skiers to load and unload while wearing their equipment. Chair lifts can be single, double, triple or quad. There is a restraining bar that secures skiers into chairs and raised when a skier gets off. Gondola: This lift is enclosed and is much like a cable car. Skiers ride inside and are transported up a mountain. This lift is not usually positioned at beginner slopes. You'll get more out of your beginner ski instruction if you take some time to practice skiing exercises prior to your trip. Being in good physical condition will make skiing easier for you. Remember to give yourself plenty of time to get to the resort and to dress for the cold weather. Do your research. Know what the resort has to offer. Does it have beginner lessons? Can you rent equipment on the premises? What slopes are suitable for beginners? If possible, avoid taking your first lesson during the most crowded days of the year, which include the holiday season. You may want to arrange a private lesson so you are sure that you will get individualized attention and learn the basics to get you started.